Just finished the first week back after 5 weeks of long service leave. I took my kindle, loaded up with many novels and, as has happened before, some of the novels I took to read were set in areas I travelled through. I do not plan this but I suppose if I like English stories and I am lucky enough to spend it in the UK, it is bound to happen. Whilst there I visited the several National Trust houses and gardens. I spent a week in the Torbay area, staying in Torquay. The weather was lovely and I was delighted to find I could take either a ferry or steam train to visit Greenway, the Georgian house and garden that was the holiday home of Agatha Christie. Many personal items and written reminiscences from family and friends make the visit worthwhile, especially if you are a Christie fan. There are many editions of her books and some of the estate has appeared in the Poirot television series. There was also a connection with the latest Wells and Wong book. This is the third book in the Wells and Wong series. Robin Stevens has written another wonderful detective story for younger readers and paid tribute to the Queen of the crime novel, Agatha Christie. The setting for Daisy Well’s and Hazel Wong’s third mystery is on the Orient Express. The year is 1935 (only one year after the original ading | Tagged: book review, children’s_literature,publication date of Agatha Christie’s “Murder on the Orient Express”) and the details of the 1930’s train and the passengers seem very realistic. Hazel and Daisy have been taken on holiday by Hazel’s father, who has forbidden them to do any more detecting but once again the girls are caught up in a mystery. In this story, just like the “Murder on the Orient Express”, the plot depends on one of the passengers on the train being the murderer and a detective on the train who will have to interview all the passengers to discover just who is telling the truth and who is lying. There are some very questionable characters in the first class carriage with Hazel and Daisy as well as Hazel’s father, who is trying to keep a close watch on the two girls. However, with their usual determination they are soon on the case. In another nod to Agatha Christie, one of our young detectives, Daisy, is actually reading a copy of “Murder on the Orient Express” in this story. This is a mystery story, with spies, priceless jewels and a murder, that will keep young readers guessing until the “clever denouement”. I would recommend it to anyone who loves the challenge of unravelling a good mystery. Murder Most Unladylike is a delightful read and it was very easy to suspend disbelief that school girls could investigate a murder, unfettered by any adult interventions in this very English boarding school crime setting. The story is set in 1934 in a boarding school for girls called Deepdene. It combines the traditional detective novel, (think Sherlock Holmes) with a bit of the traditional girls-own boarding school drama. The story is narrated (Dr. Watson-style) by Hazel Wong, a student from Hong Kong, who, with best friend Daisy Wells (the self-cast Sherlock Holmes of the duo), make up a secret detective agency that in the past had only very mundane cases to investigate. The adventure begins when Hazel finds the body of their Science Mistress, Miss Bell, in the gym. Hazel runs for help but when she returns with Daisy a few minutes later, the body has disappeared. The official from the School Headmistress is that Miss Bell is simply gone, resigned. The rumour is that it is due to a broken heart after a failed romance with the new music teacher, Mr Reid. Hazel and Daisy know better and set out to first prove that a murder actually happened and then find the culprit. Whilst the skilfully plotted murder mystery in Murder Most Unladylike is the central thread there are also many other incidental elements that provide an interesting picture that encompasses not only the actual mystery but also the difficulties the two main characters have in maintainin their’ friendship as well as wider social mores of the time about gender, class and race. Although she has been schooled by her father, who is clearly a fan of all things Anglophile, Hazel has had to learn to fit in and deal with the casual racism and small slights from her classmates. Also, given the historical context of the novel, the classes that are considered necessary, sort of good behaviour that is expected of the girls and how intelligent and smart they are allowed to be. Daisy and Hazel’s characters both play down their intelligence in class and deportment is a timetabled class. This story has plenty of charm. It is funny and clever, and as with all good classic detective stories, the two heroines complement each other perfectly. The author Robin Stevens has captured the feel of all of the classic mystery stories that I enjoyed when I was a child. It should have great appeal for many middle-school kids today. I spent 12 months in a boarding school and, although it was not English and 50 years later than the timeframe here, there is a ring of authenticity to the lives documented in the story. There is a language that goes with boarding schools and for this reason there is a glossary at the end that explains all the 1930s boarding school slang. What’s a good book for me to read? Above is a question that all those who have worked in libraries are asked many times. It is a question that I always answer with more questions. What do you regard as a good story? is one of the questions I often ask back. More information comes from me asking the students to tell me about the books they have enjoyed, the tv or films they chose to watch, the games they like to play. These are all examined before I can even begin to answer. Over the two weeks so far this term, I have spent a lot of time assisting our students find something to read for the wider reading program. Many English classes are studying a film text this term but have to continue with some regular reading, both at home and for 10-15 minutes most English classes. All our school library staff help students (and staff) not just find what the book they are looking for but also help them discover books they are not aware of or haven’t heard about. This is still a valuable service to our readers. Find the right book for them and these students/staff may become part of you “good” or regular readers. We have a digital space and offer e-books and databases and have pointers to reading and various guides, a blog and reviews. Whilst they can find out about books any number of ways , we know that there are still many in our community who like personal attention and a conversations as they look for a book. They also often like the tactile experience of reading a printed book. They still like how the book feels and smells. There are others who just love the stories. These students want nothing more than to get their hands on the story, in whatever format. This is especially so of books in series. There are many of our boys who read “safely”. They are not confident readers and they would rather re-read a book they have read and liked before than try a new one that they may not like. Series have been a great boon for us as we can find books for them to read. By reading through a series our boys often find a level of success that we use to get them on to other novels with a similar theme or style. Success breeds confidence and we can build on this as we get to know our readers. Of course there are many good readers, including the staff, who love to read series. They build a connection to the characters, the settings and/or enjoy the author’s writing style. I am collecting my thoughts on a number of popular YA series that I have been reading over the last month and will write more about them soon. The infographic below tries assist with the definition of the ‘perfect’ book. A piece of literature that pleases a broad crowd with the bestselling books having just under four hundred pages. Men are more likely to read science fiction and a story with a male protagonist. However a publication with women protagonists are much more likely to become a bigger hit. Books still seem to have a huge market, be they in digital form or in print, for the moment at least, e-book have not killed off paperbacks rather they co-exist. I find that I am often reading adventure stories about war, spies and crime. It goes with the territory working in a boy’s school and it is interesting how often things link up or coincide. Recently I watched a great 3-part series, “The Bletchley Circle“, about 4 women in post-war Britain, who are linked through their work together at Bletchley Park during the war. It is a crime thriller that has these women back together working on clues to track down a serial killer. Last week I picked up the next book in my pile of holiday “to-read” books. It was entitled “The Messenger Bird“. 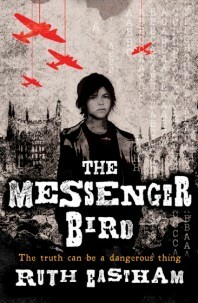 I started reading and found it too was linked to Bletchley Park and the work done there in World War II. This is the first book I have read by Ruth Eastham and I appreciate how she intertwines a modern-day narrative with historical ideas and events in a very seamless way. Nathan, the main character, is very ordinary and likeable as are his friends and the rest of his family. The story starts when Nathan’s dad is arrested for breaking the Official Secrets Act. He works for the Ministry of Defence and is accused of leaking top-secret information. As he is dragged into a police car he leaves Nathan a message, or rather a riddle to solve. He must to solve this first riddle, then find and work out subsequent clues if he is to save his dad from a life in prison. Nathan and his family have recently moved into a house owned by a great Aunt fascinated by WWII. There is memorabilia throughout the house. The clues Nathan is given lead him to another mystery that was started by Lily Kenley, a Bletchley Park employee in the 1940s, who stayed in the house during the war and then disappeared suddenly. The messages, given to Nathan by his dad, follow a path left by Lily and take him on a journey around his local area and finally to Bletchley Park. Nathan is sworn to secrecy but his friends, Sasha and Josh, learn about his quest early on and are determined to help. He has to be careful as his father indicated there are traitors in the Ministry. There certainly seems to be someone watching his every move and listening in on his conversations. With the help of his friends, Nathan must solve the mystery before the Ministry of Defence figures out what he is up to and the evidence of his father’s innocence disappears. It is a good story for younger readers upper primary / lower secondary. The book very neatly incorporates mystery, history and adventure all into one story. The references to Bletchley Park, the Enigma code and the Coventry Blitz are fascinating. The Coventry Cathedral’s ruin is incorporated into the cover.